The order book for our PFA/KFA container flats will close at midnight on Sunday October 14th. Please note containers are sold separately. Any orders received after that are unlikely to be accepted. These models are being produced for us by Rapido Trains, and now the 00 TEA tankers are almost ready for shipping the factory needs to begin preparations for this new model – clearing space and ordering in any parts and materials needed. 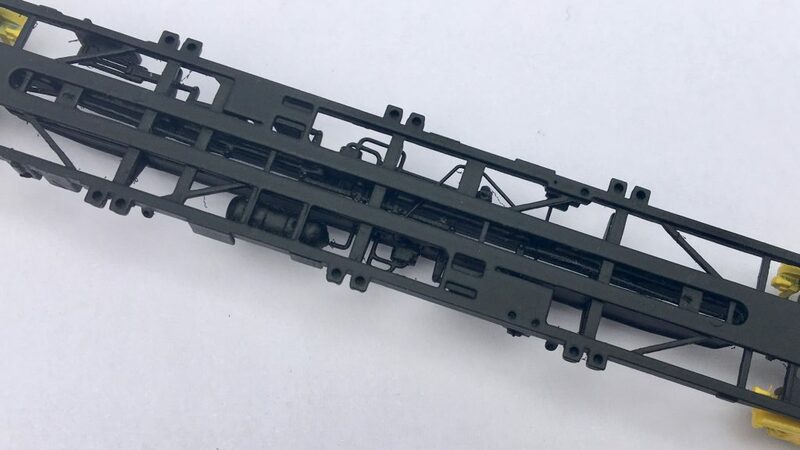 We are offering two versions – one with the original GPS bogies painted in bright yellow as a PFA in Tiphook blue with the side placard and also as a recoded KFA in Network Rail black. We are also offering the more numerous Finnish built versions with cast frame Y25 bogies and body-mounted parking brake wheels. Tiphook PFA as delivered in blue with traffic blue bogies. They are equipped with NEM couplers in kinematic close-coupling sockets, and feature high levels of detailing including brake equipment and pipe runs. The centre spine, air tanks and some other components are in metal to maximise the weight available. The wagons have been designed for our own 40’hi-cube and 20′ tank containers, produced in association with C-Rail Intermodal, but will take Farish containers. Dapol containers can also be made to fit if the overscale corner mounting pins are trimmed slightly. Models shown are unlettered, hand-painted EP samples. Production models will be fully finished and lettered. Please note that no orders can be guaranteed after midnight on October 14th 2018.